This release is a clear cassette shell with a centered barcode on the j-card. The front cover portion of the j-card has the "Fantasy" logo printed in a deep red along the left edge. 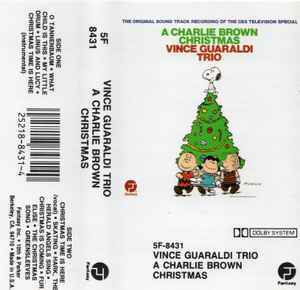 A similar release with a white cassette shell and "Fantasy" printed in black ink without the round logo can be found here Vince Guaraldi Trio - A Charlie Brown Christmas.